Currently available only for PledgeCents partners. 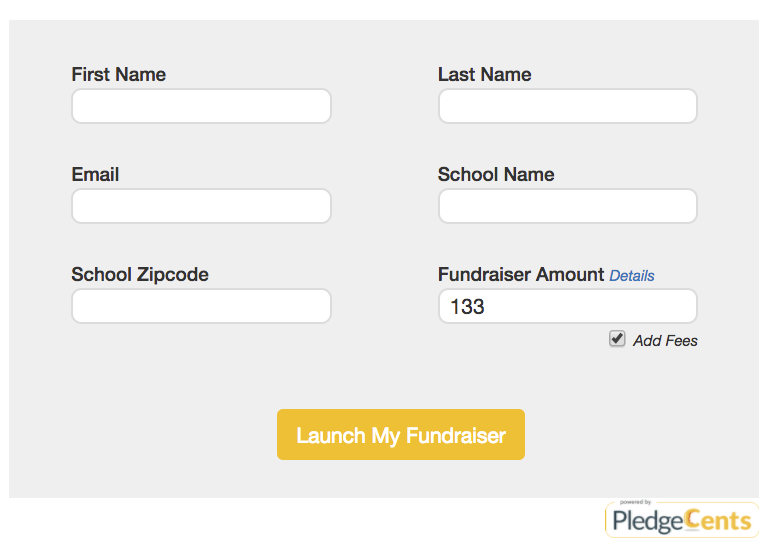 For documentation on the PledgeCents fundraiser creation API, please click here. Every request from the PledgeCents Widget is validated with the unique API key given to each of our partners. The PledgeCents widget is the fastest and easiest way to give your users access to fundraising for your producs and/or services! This will load all of the scripts and styles needed to display the PledgeCents widget, and make it fully interactive for your users. If you do not yet have your unique API key, contact info@pledgecents.com. The HTML code to the right of this text will be the widget container. The widget will appear wherever you paste this code. This is where all your widget configurations will happen. The attributes in the code sample (data-price, data-product-name, etc.) will allow you to display the name and price of the product or service you're making available for fundraising. If the product or service that the user will be selecting won't be known until after page load, have no fear! PledgeCents has provided options for programmatically setting or changing the price and name of your product or service in our widget. If you would like the constrain the size of the widget, you can apply a width, height, or both to the widget container. If you would like to hide the widget until a certain event is triggered, you can alter the display property of the widget container. This is the fun part! The PledgeCents widget comes pre-packaged with four options to give you more control over how your users interact with the widget, and to fully integrate it into your site. One of the most important settings on the widget is the price. This will control what goal is set for your user's fundraiser! There are several different ways the price can be set for the widget. The simplest way to set the goal amount for your user's fundraiser is to set it as the value for the data-price attribute, as seen on the right. If you replace the highlighted text with the price of your product or service, it will immediately have all applicable fees calculated and added on, and will be shown as the original price in the detail view. This is the best option to use when you know the price of the product or service your user desires when the widget first loads. For example, on a checkout page. If you need to add or adjust the price of your user's fundraiser after the widget has loaded, the PledgeCents widget provides a public function to allow you to easily make as many price adjustments as needed. 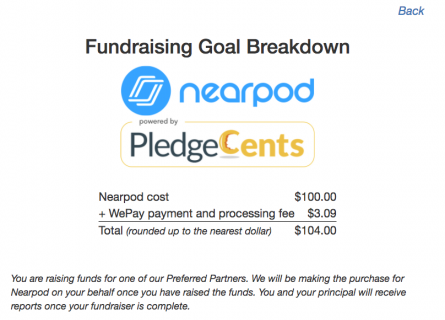 If you don't want to set a goal amount for your user's fundraiser, you won't be required to. If data-price is left empty, and setNewPledgeCentsFundraiserGoal is never used, the user will be free to enter any goal amount they choose. Warning: this option is not recommended. If no initial or suggested fundraiser goal amount is set, there is no guarantee that the user will choose to raise enough funds to have access to your product or service. The product name is the name of the product or service that the user will be fundraising for. Much like the fundraiser goal, the simplest way to set the product name that will appear in the widget's detail view is by setting it as the value of the widget container's data-product-name attribute, as seen on the right. If you do not know what product the user will be fundraising for when the widget first loads, the PledgeCents widget provides a public function to change or update the product name. If no product name is set, the default name displayed in the widget's detail view will be the name of the PledgeCents partner. The widget's detail view is where the user can see a breakdown of all the fees associated with their PledgeCents fundraiser. Enabling detail view is highly recommended so that users can see a line by line breakdown of where the funds they raise will go. When detail view is enabled, a link will appear next to the Fundraiser Amount field. When the user clicks on that link, the widget will switch to detail view mode. (See below). To exit detail view, the user can make use of the Back link in the upper right hand corner of the widget. This will take the user back to the main widget view. If detail view is disabled, there will be no small details link near the fundraiser amount input, and the user will not have the option to see the fee breakdown of their fundraiser. It is recommended that you remove the user's ability to edit the goal amount for their fundraiser. When a goal amount is set by you, the partner, all applicable fees are calculated and added to the initial goal amount. This ensures that the fundraiser goal will always be set to an amount that, if the fundraiser is successful, will give the user full access to the product or service they desire. If goal editing is enabled, there is no guarantee that even with a successful fundraiser, the user will be able to afford access to the product or service they are raising funds for. When goal editing is disabled, the user is unable to edit the fundraiser amount provided by you, the partner. The Add Fees checkbox is visible, but also unable to be edited or switched off by the user. Detail view will remain available to the user if it is enabled. When goal editing is enabled, the user will have the ability to set their own fundraiser goal, and to remove the calculated fees from their fundraiser if they so choose. If fees are enabled, they will be re-calculated and added to the total whenever the user sets a new fundraiser goal. Detail view will remain available for the user if it is enabled. Being able to test the integration of our widget into your site is important. PledgeCents provides a very simple way to put your requests in 'testing mode'. Simply add the attribute data-testing with a value of true to the widget container as seen in the code sample on the right. How is Testing Mode Different? Any fundraiser created while the widget is in testing mode will only be accessible through the 'View My Fundraiser' button (i.e., is not visible to the general public), will not be able to receive investments, and will be removed from the site within 24 hours. The PledgeCents widget provides public functions to add or alter any form data for all user-editable fields. What Does 'Add Fees' Mean? PledgeCents collects a small fee from each fundraising page to cover payment processing. When detail view is enabled, the user can view a breakdown of all applicable fees directly from the widget. The Add Fees checkbox, when goal editing is enabled, allows the user to add or remove the added fees from their fundraiser goal amount. For reasons described above, PledgeCents highly recommends taking fees into consideration when setting a fundraising goal. When a fundraiser goal amount is set using any of the methods mentioned in the section on setting a price, fees are automatically calculated and added onto the total fundraiser goal.